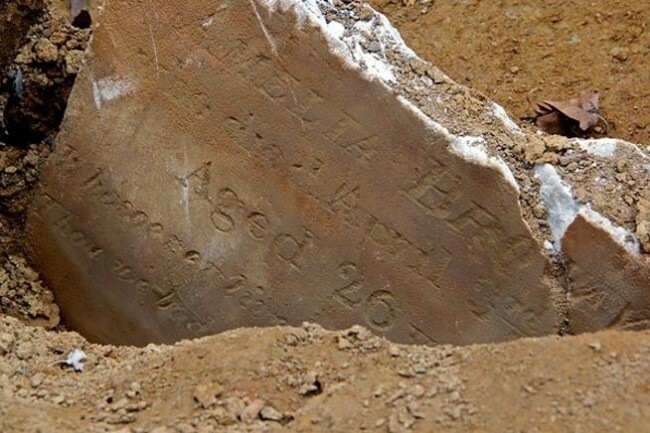 Twenty-four-year-old Mary Jane Laws died this date, May 21st, in 1848 of an intestinal disorder (Gastritis) and was buried at Bethel Burying Ground. Ms. Laws lived across the street from Mother Bethel Church on the corner of Little Pine St. (now Addison) and 6th Street. The Laws’ residence would have been situated where the white car is pictured. Ms. Laws is one of a dozen of the Laws family (that we know of) that are buried at the Bethel Burying Ground. Stephen Laws was an original trustee of Mother Bethel who died in 1814 and was also buried at the Bethel Burying Ground. Four-year-old William Ayres died this date, April 28th, in 1850 after being crushed to death by a horse-drawn trolley and was buried at Bethel Burying Ground. I was unable to positively identify the child’s parents. There are some clues, but nothing definitive. The vehicle that crushed the child was the Omnibus No. 12 owned by John Levering. It would have looked similar to the one in this photo. These “horse buses” were the later cousin of the old stagecoach and could carry many more passengers. The service was established throughout the city of Philadelphia in 1831. These were the predecessors of today’s trolleys and buses. Fifty-four-year-old George Miller died this date, April 11th, in 1842 of Tuberculosis and was buried at Bethel Burying Ground. I have not been able to locate him in census records or city directories. This is not at all uncommon. Those that had escaped their enslavers and found their way north to Philadelphia would not welcome their presence published if they could avoid it. Mr. Miller was employed as a woodsawyer according to his Death Certificate. He lived in one of the worst neighborhoods in the 7th Ward. St. Mary’s Street was the epicenter of Black vice that included prostitution, gambling, and illegal speakeasies. It is where the poorest of the poor lived in conditions that are hard to imagine. Mr. Miller lived only about a block and a half from Bethel Church (now Mother Bethel). Three-year-old Isaac Lee died this date, March 8th, in 1849 of Catarrhal Fever and was buried at Bethel Burying Ground. Researching census data it is likely that Isaac was the son of Mary Isaac. His father’s name is not recorded and it is reported that he was physically unable to work. Mary’s occupation was as a “day worker.” They paid $5 a month for their room. They had no other children. Mary or her spouse were reported to have been previously enslaved and gained their manumission by paying $100. It is possible that Mr. Lee’s disabilities occurred while he was enslaved and that is why the manumission price was so low. Catarrhal Fever is similar to Influenza – inflammation of mucous membranes, especially of the nose and throat. The house that the Lees lived in was soon torn down after Issac death and the grand Continental Hotel was build at 9th and Chestnut. It is now known as the Ben Franklin.